1) Fresh eggs. I hatch a lot of eggs, but we do eat the eggs I don't put in the incubator. There are a LOT more eggs in the winter when I'm not hatching as much. Keep what you need and sell the extras. 3) Bug control. Chickens will demolish the grubs in the garden! They love cabbage worms, but prefer if I toss them to them. I've often found an ant nest while digging in the garden and the chickens have attacked it scarfing down every single egg they can find. They're not as fond of the adult ants, but we had a lot of ants and they have made a huge dent in the population. Guineas are especially fond of ticks and will wander through the yard and woods searching them out. 4) Compost. Chicken poop is high in nitrogen (green) and the chickens have wood chips in their coops for bedding (brown) which is exactly what you need to make compost! Awesome, right? Oh sure, I usually add in moisture and more green material but basically poopy chicken litter is the perfect compost starter. Compost makes the garden grow beautifully. 5) Mini garbage disposals which will consume any leftovers we may have. Anything that I can't compost, I feed to the chickens. They like pasta, rice, oats, bread, meats....pretty much anything from the kitchen. 6) They make a great garden clean-up crew! Let them free range beneath the grape vines and fruit trees and they'll clean up any fruit that falls off before it attracts bugs. Just be careful about those low hanging vines....mine learned to pull on them to make the grapes fall off! 7) Alarm system. The geese are the best at this but the Guineas still do a bang up job of hollering their heads off whenever someone pulls into the driveway. They also holler at deer in the woods and the occasional stray dog. It can get noisy here but I always know when someone shows up. 8) Teaching kids responsibilities. Caring for chickens is a great chore to help teach kids responsibility. Even the smallest kids can help collect eggs. Older kids can help feed and clean coops. My teenager helps sell chicks at poultry swaps. 9) Amusement! Have you ever watched 2 male guineas run around and around the house like little road runners? Hilarious! There is nothing funnier then dropping a few meal worms or grapes into a chick brooder and watch them run around squealing about their treats! Or when you throw the first treat out to the hens and one snatches it and runs away....then the rest follow trying to steal the treat. Too funny. They can be trained if you have some patience. This one walks on a leash and even goes to shows and meets people/poses for pictures. Although the first year is expensive after that it's all about the balance...what you get from them needs to be worth more then what you spend on them. 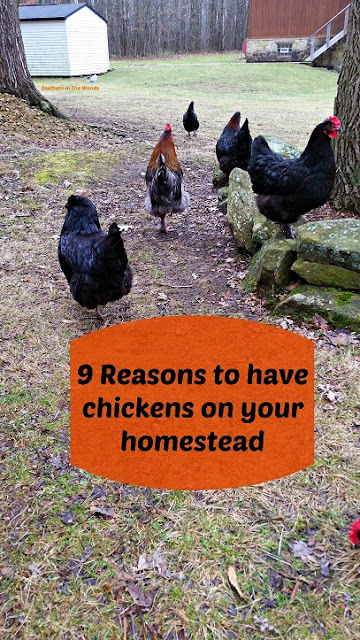 If that's the case, then yes chickens do have a place on your homestead. For more information on raising chickens or guineas check out: Murano Chicken Farm. Oh yes, I can see that chickens would be so entertaining! All of the reasons that you gave are wonderful. I seriously have been contemplating whether or not to get a few for my little 1/3 acre yard. Would love them for the eggs, pest control, and fertilizer. Oh heck, I'd love them for all of the reasons you mentioned! Thanks for sharing with SYC. Happy to be a new follower. I'm glad that you liked the post! You should get a few chickens, they're great!